The Export>PDF function allows you to export one or more entities of geometry as a .pdf file. If you do not select one or more entities and click Accept, all displayed geometry is exported as a .pdf file. In the Save as type field on the Save As dialog box, you can select the file type as 2D PDF or 3D PDF, when exporting a model as a .pdf file. When selecting 3D PDF, the model's three-dimensional facet data is saved using the compressed U3D ECMA 1 PDF format which is supported by Acrobat Reader 7.x and higher. 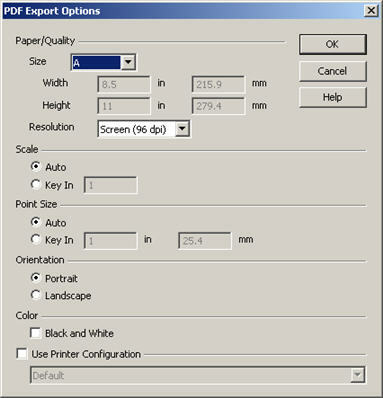 When you click File>Export>PDF>Options, the PDF Export Options dialog box appears, as shown and described below. Size: Select the size paper on which you are printing. Width and Height: If you selected Key In in the Size field, type the width and height of the paper on which you are printing. Resolution: Select the desired screen resolution. Key In – Allows you to enter a plotting scale value manually. Take, for example, the case where the model is one-inch wide and the paper on which you are printing is eight-inches wide. If you type 7 in the Key In field, the model is printed seven times larger on the paper. It would be seven-inches wide on the eight-inch wide paper, leaving one-half inch on each side. Point Size: Use to specify the size of a printed point entity. Auto - Select so that the Point Size field setting on the Set Configuration Options dialog determines the size of the printed point entity (Tools>Options>Display). Key In - Select if you want to specify the size of the printed point entity by typing the value in inches or millimeters. Once you type the in value and press the TAB key, the mm field is populated with the equivalent value, and vice versa. Orientation: Select whether the paper on which you are printing is portrait orientation or landscape orientation.